Let’s chat, shall we!? Time to end the lazy slump I’ve been rolling in lately. A lot’s been going on around here and I’m up for a full disclosure now. I did slip the news on Instagram couple of weeks ago but didn’t announce officially on the blog. So here it goes!! Drum-rolls please!!! I am going to LONDON this FALL for a one year postgraduate programme!!!!! WOHOOOO!!!!!!! HOW AWESOME IS THAT?!! Sorry for all the yelling but I’m SOOOOO excited for this new chapter of my life to begin. This year has been truly magical so far! I got the confirmed offer on my admission about a couple months ago but was skeptical on sharing the news as there were so many things to consider and plan for before I decide to accept the offer. Let’s just say I didn’t want to jinx it! I was ecstatic (to say the least) to get into this prestigious college. I was (still am!) over the MOON would be an understatement. I leave in September and there is so much to do. I need to visit my parents, apply for Visa, do the shopping, pack my bags and off I go. Fingers crossed for a smooth sailing! 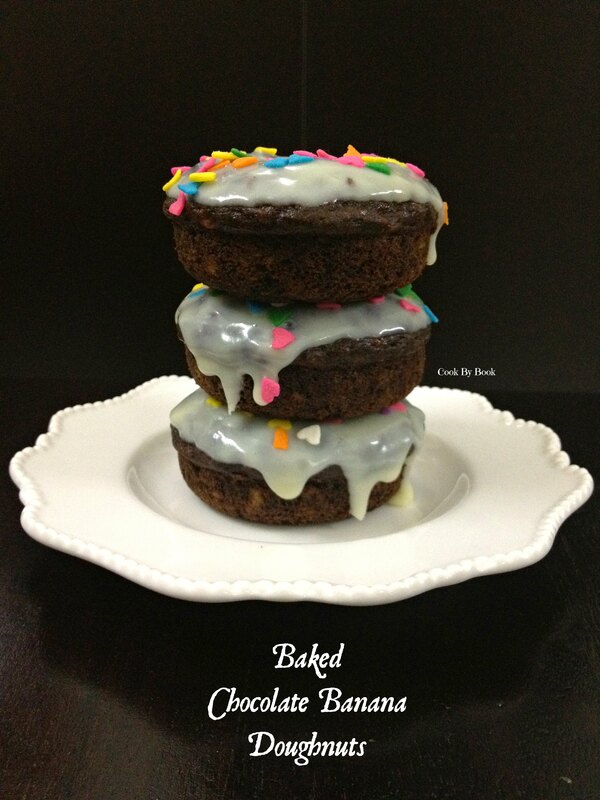 This recipe I am sharing today is bonkers awesome! It is the quickest meal I have ever made (apart from toss-in-all-you-have salads or couscous!). 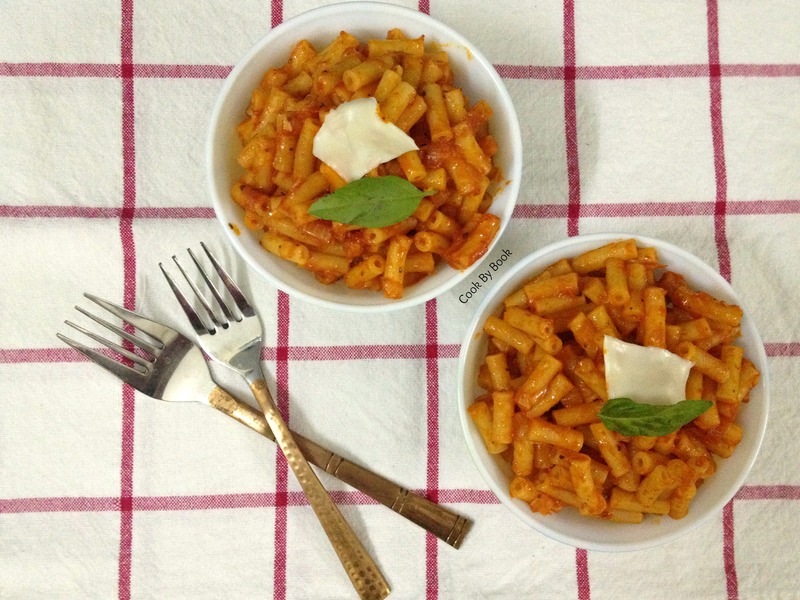 If you can boil the pasta then you can make this recipe. This one here is basically foolproof! 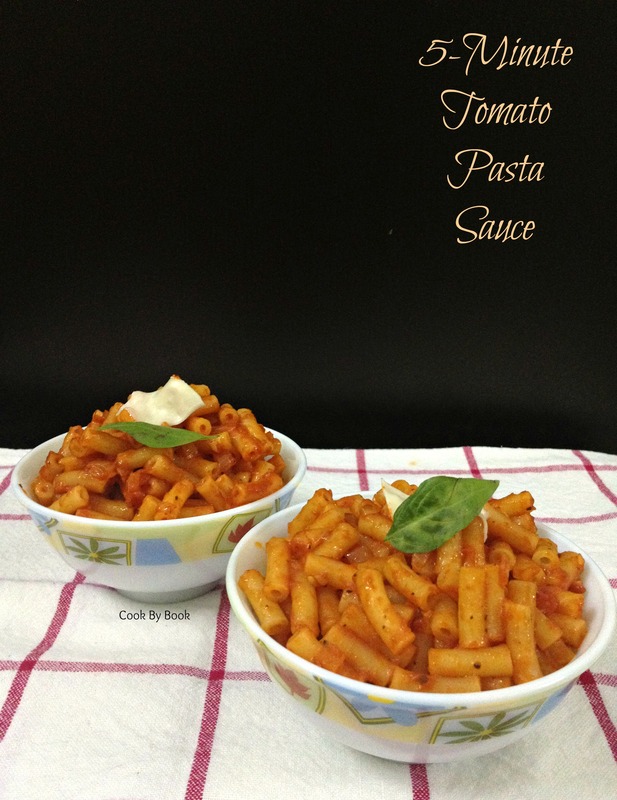 The tomato paste (Brand name – Splitz) I used for this quick pasta sauce is made locally in Bangalore and the ingredients list reads – Tomatoes. That’s it! It does not have any funky ingredients I can’t understand or pronounce, just pure tomato goodness without any color or preservative or salt! Too good to be true and but sadly, it is mostly available only in Bangalore. But fret not. You can go ahead and try any other good, organic tomato paste you can find in the store near you. Cook pasta as per the package instructions. Reserve 1 cup of pasta water and drain the pasta. In the meantime, heat the pan on a medium-high heat. Add olive oil, garlic and onion and sauté for a minute. Add tomato paste and salt and sauté for about 2-3 minutes, scraping and stirring occasionally. The tomato paste will turn brown and this will enhance the flavors. Mix in basil and pepper and cook for another minute. Stir in 3/4 cup of reserved pasta water to the tomato paste and magically you’ll get your pasta sauce ready! If you want thinner consistency sauce, add remaining 1/4 cup pasta water too. Stir in the drained pasta. Divide between 2 serving dishes. Top with some shavings of Parmesan cheese and fresh basil leaves. Serve immediately. *You can add vegetables of your choice to make the meal more hearty. Just sauté the vegetables along with garlic and onion before adding tomato paste to the mix. Zucchini, broccoli, eggplant, bell peppers…. sky is the limit! *You may also top the pasta with capers or olives. *Use whole wheat or quinoa pasta to make this meal healthier. *Use penne or spaghetti pasta instead of macaroni. This peanut butter-flavored dish is a cinch to throw together. So convenient on a weeknight or when you’re just lazy. Just boil a pot of water, saute some vegetables and whisk together some sauces from your pantry. Dinner is served! *You may use toasted peanuts too instead. Boil a medium sized pot of water. Add the whole wheat noodles and cook according to the package instructions. Drain and set aside. Heat a pan over medium high heat. Add oil and sauté garlic for about 30 seconds. Add red pepper and broccoli to the pan and sauté for another 5 minutes over medium high heat. Season with salt and pepper. Whisk together all the ingredients for sauce, adding the hot water in increments at the end. You are going for a thin yogurt-like consistency. 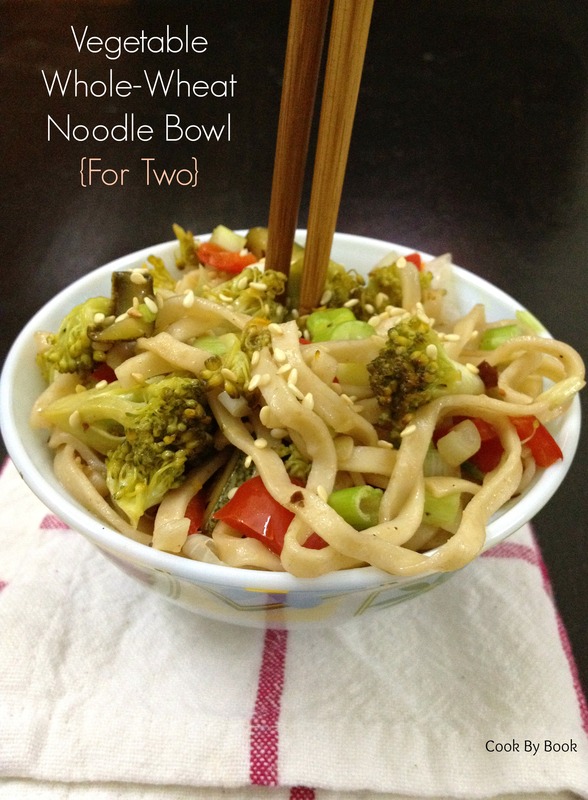 Once the noodles are cooked and drained, toss together the noodles, sautéd vegetables and scallions. Portion into small bowls and top with a generous sprinkling of sesame seeds. Serve immediately. These lovelies are so pillowy, you may want to sleep on them! They are perfectly cakey plus each bite is wrapped in cinnamon. Your house will smell dee-vine! The batter comes together easily in one bowl, without using any mixer. 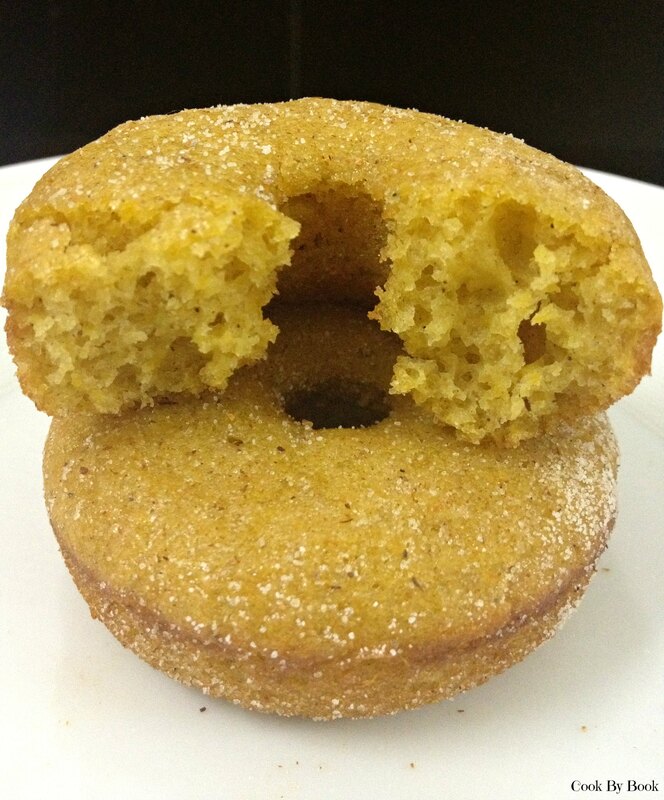 If you don’t own a doughnut pan, here is a good news, you may easily bake them in a muffin-pan! I am not going to ask you to make them first thing in 2014 ‘IF’ your new-year resolution is to eat healthy as they are not completely low-fat but do indulge in them on your cheat-day as I can guarantee that you’ll absolutely LOVE them without regret! Preheat the oven at 180ºC/350ºF. Grease the doughnut pan with oil and set aside. 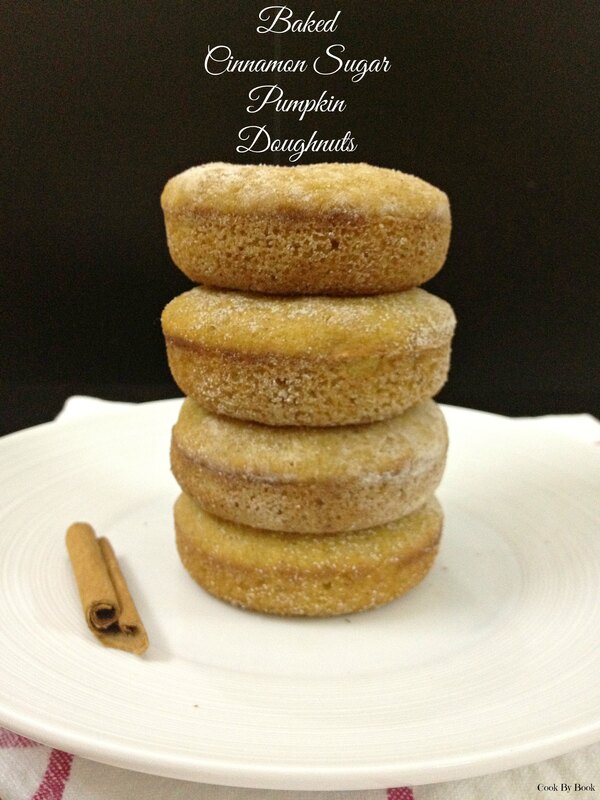 In a medium bowl, whisk together flour, pumpkin pie spice, salt, baking powder and baking soda. Set aside. In a large mixing bowl, whisk together egg and sugar. Beat in oil, pumpkin puree, yogurt and vanilla extract one by one. Slowly fold in dry ingredients to the wet ingredients. Do not overmix the batter. Mix just until no flour pockets remain. 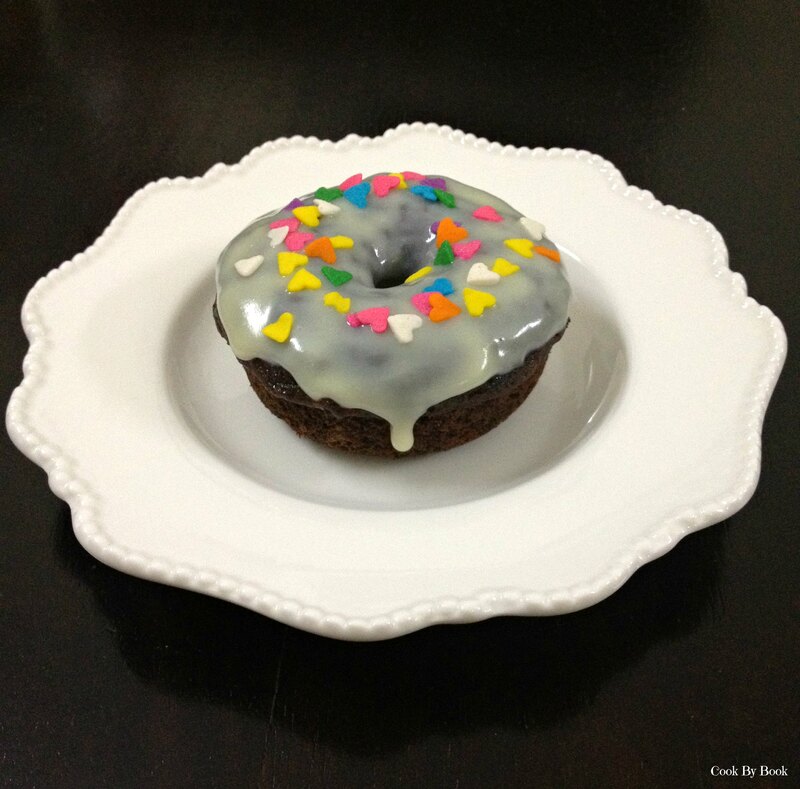 Carefully spoon the batter to the doughnut pan, filling not more than 3/4th. Bake for 13 minutes. Let cool in pan for about 5 minutes and then invert on the cooling rack. 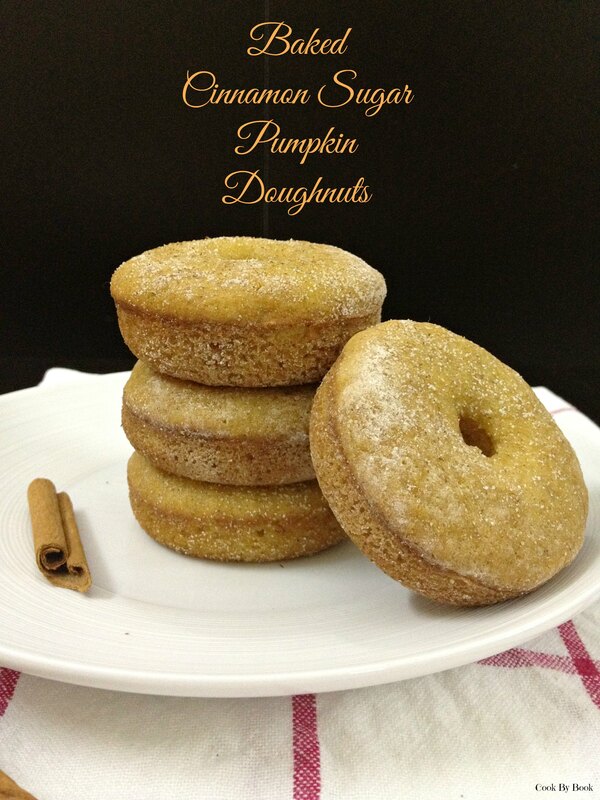 In a zip-lock bag, combine vanilla sugar and ground cinnamon. 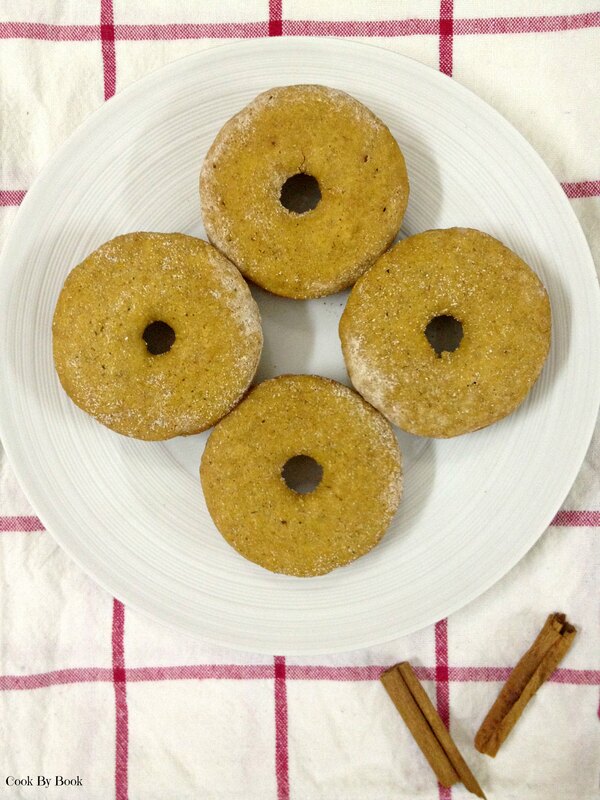 One at a time, put the still-quite-hot doughnuts in a bag and shake lightly to cover. Remove from bag and serve! Store in an airtight container at room temperature for 2-3 days. I started hunting for recipes months ago. And I got to know that Christmas cakes have got such bad reputation! They are quite infamous for being boring, dry, overly sweet and like a hard brick that I was fairly skeptical at even attempting to make it at home. It deterred my enthusiasm quite a bit. Hence it was a pretty daunting task zeroing on THE recipe. But finally chanced upon the one which spoke to me and boy, hold your breath people, I have found THE recipe for your Christmas cake this year! The recipe is fairly simple. As I told you before, the fruit-mix needs to be soaked in advance. Then a night before making the cake, just simmer few ingredients. 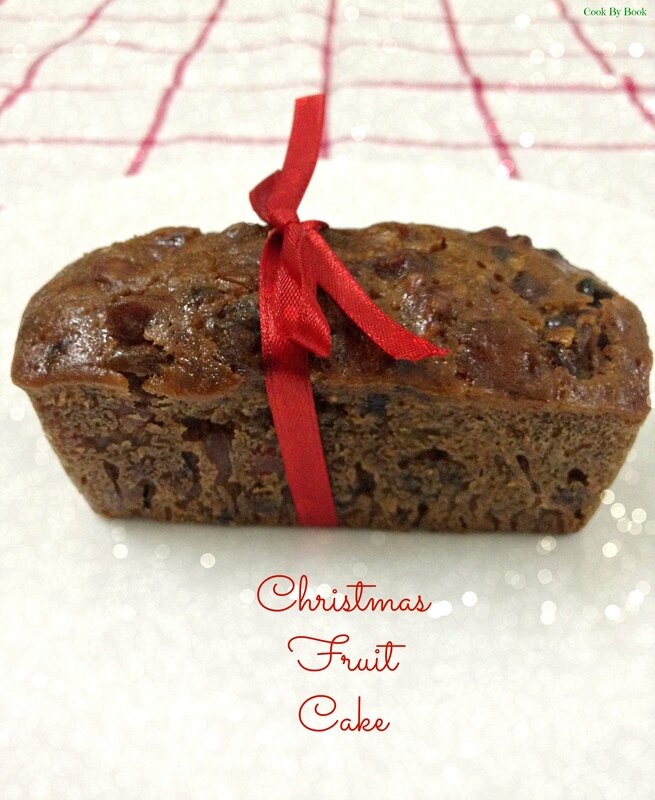 This step guarantees moister and softer cake as the fruit-mix get a chance to soften up a bit. Dump all the other ingredients into this mixture. And that’s it! You know I have a thing for simple and quick recipes and this was just that! Pop the cakes to be baked in the oven and forget about them for an hour. Do whatever you do in the meanwhile like get lost on Pinterest (so addicting!) or doing your nails (perfect utilization of time!) and they’ll be ready! I did a taste from my mini loaf and the cake was supremely moist! Success!! Pour the chosen liqueur over dried fruits and roasted nuts and store this mix in a glass airtight container in a cool,dry place. Combine prepared fruit-mix (fruits+nuts+liqueur), butter, sugar, honey, orange juice and baking soda in a large saucepan. Stir over low heat until the sugar has dissolved. Bring the mixture to boil and simmer for about 5 minutes over low heat. Stir consistently. Remove the saucepan and leave to cool. Do this step a night before or few hours before making the the cake as it takes sometime for the mixture to completely cool. Preheat the oven to 150ºC/300ºF. Grease 8×4 inch loaf pan and 6-count (3×2 inch) brownie pan with butter. Set aside. In a medium bowl, sift together flour, milk powder, zests and ground spices. Gently stir in eggs to the cooled fruit mixture. Fold in the dry ingredients. Divide the mixture in to 2 parts and pour one half in loaf pan and the other half in brownie pan. Bake for about 60 minutes or until top slight cracks and is cooked. 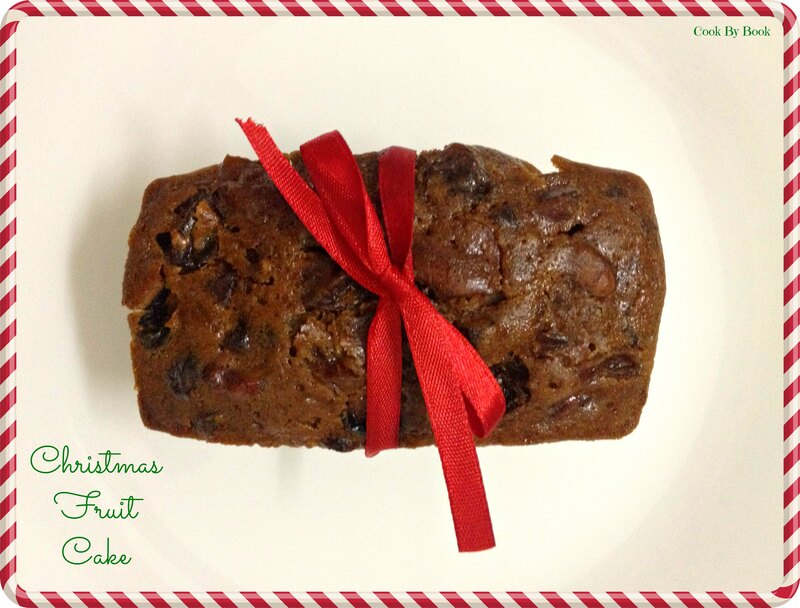 Remove the cake from the mould after letting cool for 5-10 minutes and generously brush the tops with brandy/rum. If you’re bold enough, make several holes in the cake by inserting skewer through n through at several places and pour the liqueur generously. Tightly cover with multiple layers of aluminium foil and finally with plastic wrap. Store in an airtight container. The cake tastes best eaten after a few days of aging. If you’re making weeks ahead like I did, brush the cake with brandy/rum every 6-7 days. *Serve with a dusting of powdered sugar and decorated with glaced cherries and slivered almonds. 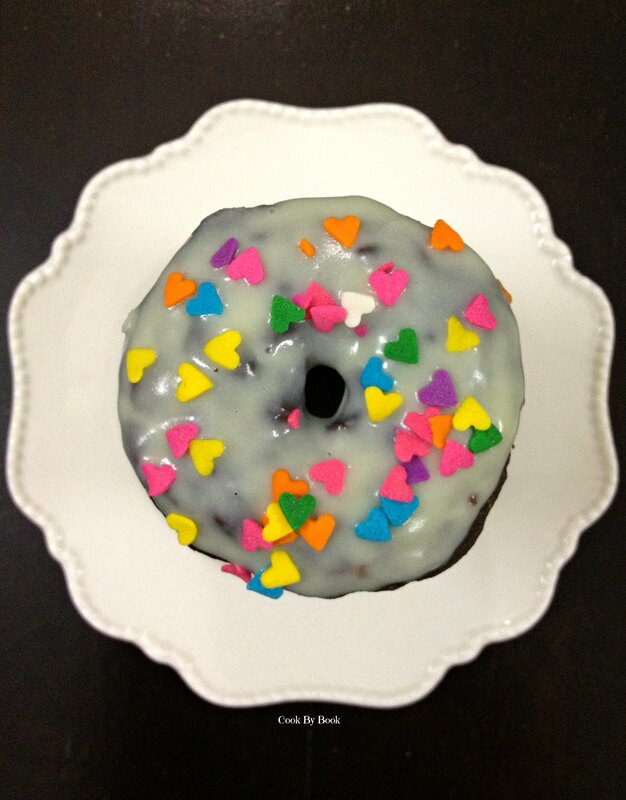 ♥ Another great recipe I chanced upon is here. Do check it out! 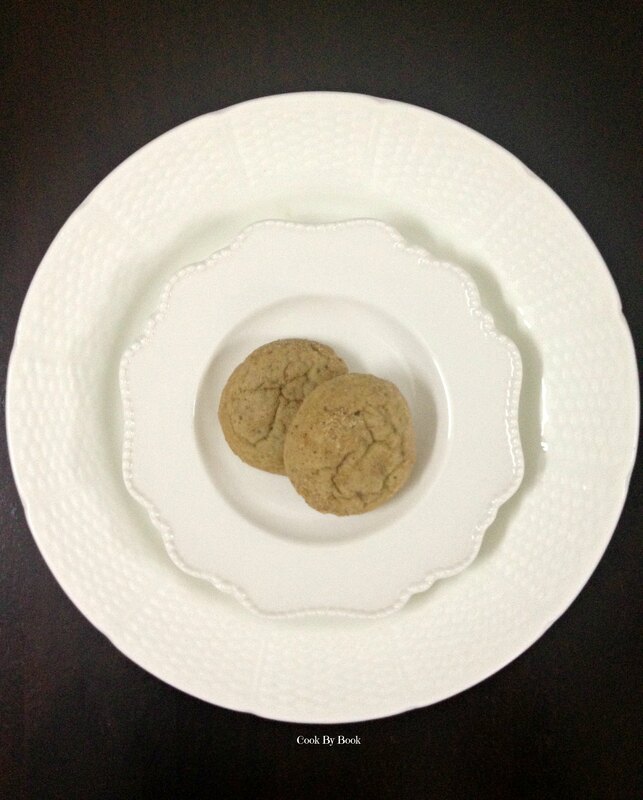 Third & final recipe of the cookie swap! My third match was Himanshu of The White Ramekins. He has such an amazing blog. Scrumptious recipes accompanies beautiful photography. His blog is a delight to see and read! This recipe is unbelievably simple, made with simple ingredients which I always have handy. I am sure you will too. 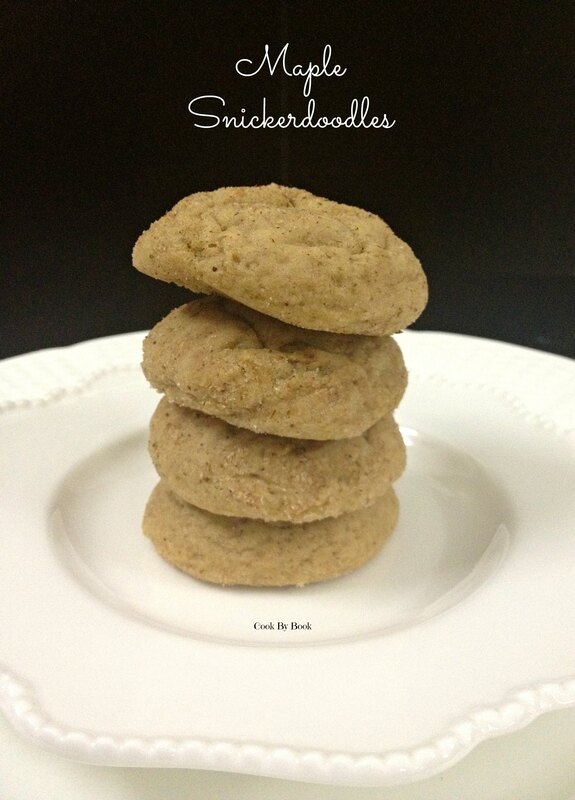 I love everything cinnamon and these cookies fit the bill perfectly for all the cinnamon lovers! Perfect for the holiday season! 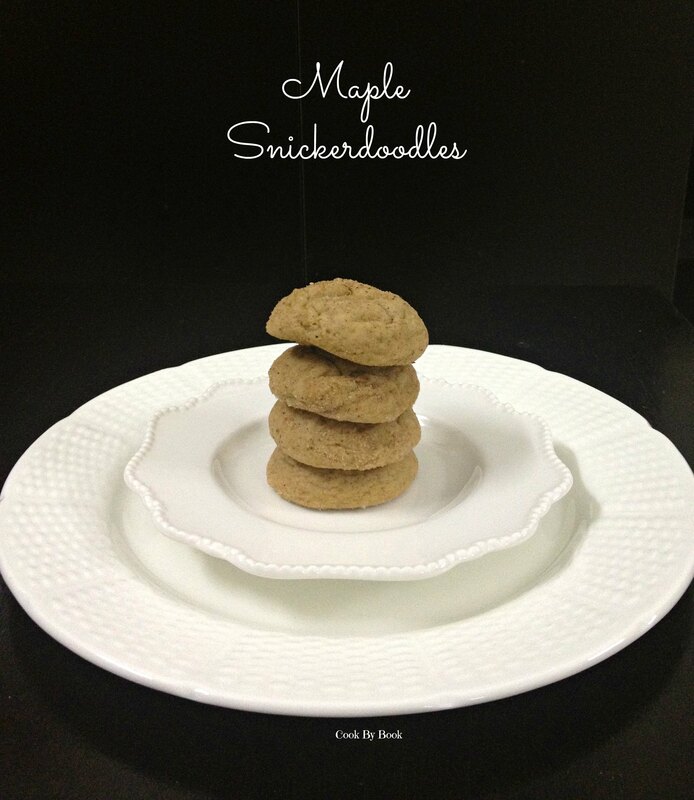 These cookies are soft, thick and pillowy with a subtle hint from maple. I like my cookies soft so I baked them for just about 10 minutes but if you don’t then extend the baking time to 13 minutes. 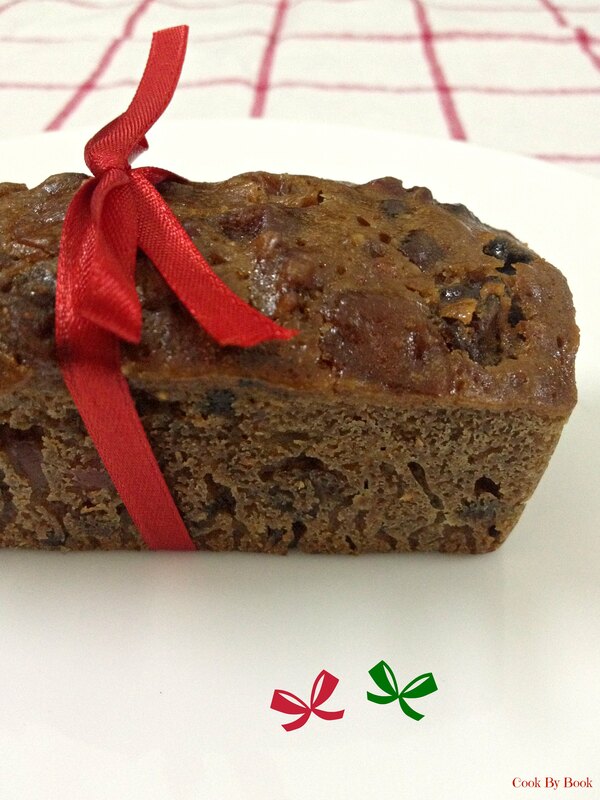 Happy Christmas baking all of you! In a small bowl, whisk together flour, baking powder, baking soda and cinnamon. Set aside. In a bowl of your electric mixer, beat the butter until soft. Add sugar and beat until light and fluffy on a medium speed for about 1-2 minute. Beat in maple syrup and egg. Gradually add dry ingredients to the bowl and beat at slow speed until no flour pockets remain. Let the dough chill in the refrigerator for 30 minutes to 1 hour. Do not skip this step as the dough is unmanageable at the room temperature. Preheat the oven at 180ºC / 350ºF. Line the cookie sheet with parchment paper. In a small dish, mix together the topping ingredients. Take about 2 Tbsp of dough and form it into a ball between your palms. Roll the ball in the topping mixture making sure they get coated thick and even. Arrange the dough balls on cookie sheet 2-inch apart from each other and bake for 10-11 minutes. Do not overbake. The sides should be golden and center may seem soft but it will set once cooled. Let the cookies cool on a cookie sheet for 5 minutes before transferring it to a cooling rack. Once cooled completely, transfer it to an airtight container. Cookies keep fresh for about 7 days at room temperature. I am so stressed nowadays.. And the reason for all the stress is not real life.. But internet life.. I know I haven’t been posting much but I have been lurking around and appreciating what all the food bloggers are up to. All over the internet I am seeing incredibly delicious holiday food..
Christmas IS actually upon us!!! Oh my gosh! I mean where DID November go?! I mean where did the year 2013 go? I am still trying to wrap my mind around this reality and meanwhile December is already slipping away at a lightening speed. Looks like everyone is ready for it but me. Web is getting bombarded with countless uhh-mah-zing fudge and truffle recipes. Peppermint and chocolate is in the air! Red and green are ruling! And all I have got to post today is SOUP! I mean don’t get me wrong… I totally adore soup! The temperature is fluctuating constantly around here so it is perfect for the season! 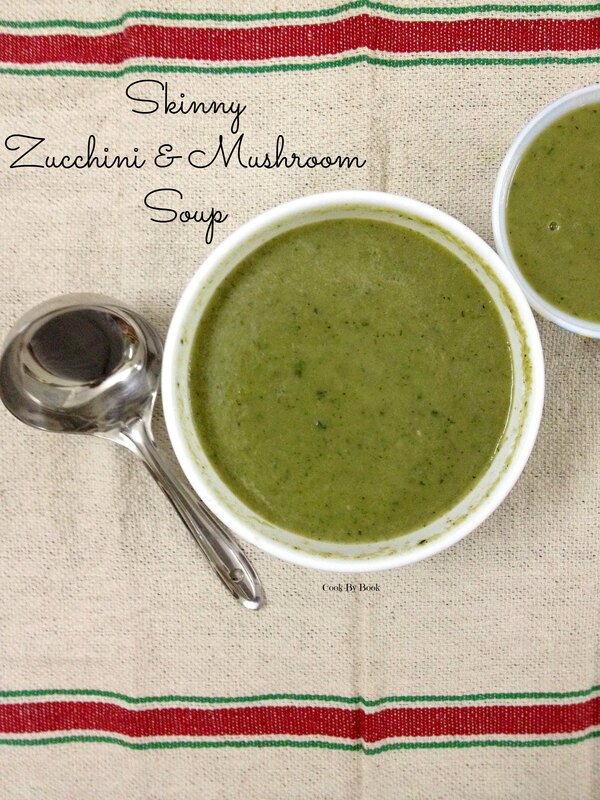 This light and skinny soup is so easy to make just like all the other recipes I post over here. One pot meal = happiness! Give me a mug of this cozy soup with garlic bread and I am in heaven! Heat the skillet on a medium heat and add margarine to it. Sautè onions and garlic cloves on a low heat till pink and translucent. Add zucchini, mushroom and thyme sprigs to the skillet and sautè till cooked for 10 minutes. Add 1 cup of water to it and let it boil. Turn off the heat. 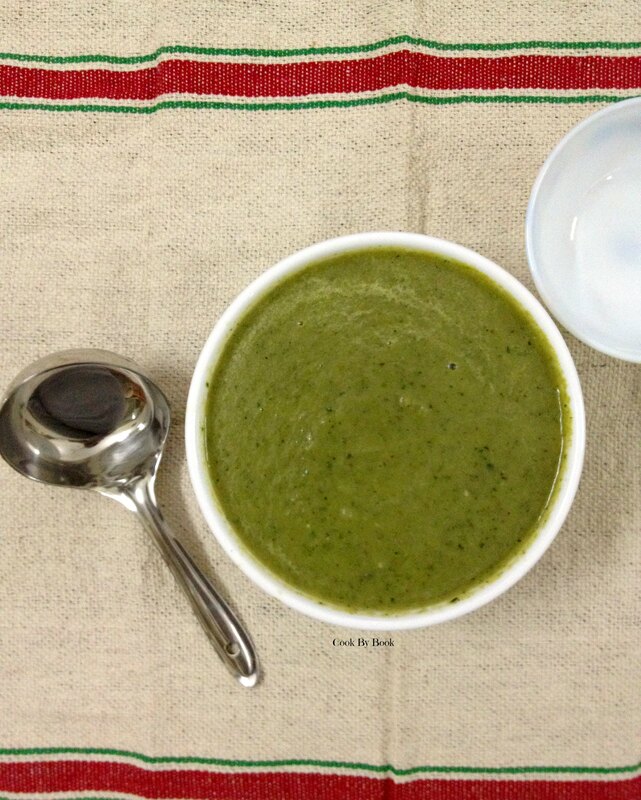 Remove the thyme sprigs and puree using a hand blender/food processor. Add this puree and another cup of water to skillet and let it come to boil. Season with salt and pepper. Adjust the consistency of the soup by adding more water if needed. Serve hot! *Serve it with shredded Parmesan for a cheesy kick!